Bushnell 363500 Onix 350CR GPS Digital Navigation System 363500 FREE SHIPPING! 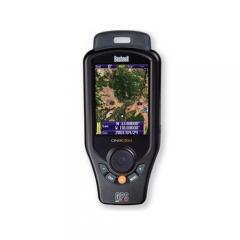 The Bushnell Onix 350CR is a portable, handheld GPS designed for reliable back-country navigation. Its WAAS-enabled 20-channel GPS receiver provides precise positioning. The full-color 3.5 inch LCD screen is easy to read, and its screen layering allows you to keep compass, map and navigation information on-screen all at the same time. In addition to its GPS functionality, the unit can store up to 150 satellite photographs and topographical maps. Each one is georeferenced, making it easy to compare the landmarks around you to the stored image for accurate navigation. The 512 megabyte SD card can also contain up to 1000 waypoints, 50 routes and 20 trails to guide you through the wilderness. The unit features a Safetrack battery conservation mode to extend runtime, and comes with rubber armor to protect it from shocks and impacts, keeping it in working order from one end of your journey to the other. ©2002-2019 CopsPlus.com: Bushnell 363500 Onix 350CR GPS Digital Navigation System 363500 FREE SHIPPING!